Balloon twisting can be great fun. With a few balloons, and a little bit of patience, you can find yourself making many new and exciting pieces of art. 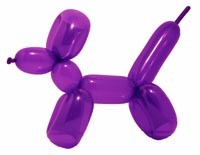 The first balloon sculptures people usually learn is the basic balloon dog or animal, created from a single balloon. Many types of balloons can be used to create balloon art. The most common balloon for twisting is a called a 260. This is probably what you'll find in your local party store under the names of 'animal', 'sculpting', or 'twisty' balloons. When inflated fully, a 260 is approximately 2 inches in diameter and 60 inches long. Likewise, if you find a 160 or 350 those balloons will be 1 inch x 60 inches or 3 inches x 50 inches, respectively. These balloons are very hard to blow up with your mouth in the correct way. Just like blowing a trumpet, you have to be careful to hold in your cheeks (you shouldn't let them fill up and become overly round). It's much easier, and safer, to use a hand pump. Some pumps are made just for inflating balloons. Beginners often use bicycle pumps or basketball pumps to get started. Inflate a 260 balloon. Leave about 4 inches uninflated in the tail end. As you twist the balloon, some air will get squeezed into this uninflated part of the balloon. Fold the balloon about six inches from the nozzle end. Now part of the balloon will be sitting along side itself. Squeeze both portions of the folded balloon about 2 inches from the fold (where the arrows are in the picture shown below). Then twist the the balloon in a circular motion where you squeezed it. The twist will hold together once you rotate the twist 2 or 3 times. If you look carefully, you'll see that you just made the ears of the dog (the short end with the knot and nozzle has become the nose, or muzzle, of the animal). The front and back legs are made the same way as the ears. Fold the balloon an inch below the twist that formed the ears, then twist the balloon in a circular motion (forming the front legs). Finally, fold the balloon 2 inches away from the twist that formed the front legs, then twist the balloon in a circular motion. Now that you've completed your first attempt, try again with another balloon. Your scultpures will get better with practice. You can try variations like adding individual twists between the ears and legs, or varying the lengths of bubbles. Can you make a short dog? How about a giraffe?